Back to school, a new term begins and Autumn is knocking on the door… but not quite yet as summer will hang on by its fingernails in Reigate! A flirt with cooler Autumnal conditions, a last blast of summer heat and a possible thundery breakdown are all packed into next week … so read on as the weather gets more interesting. 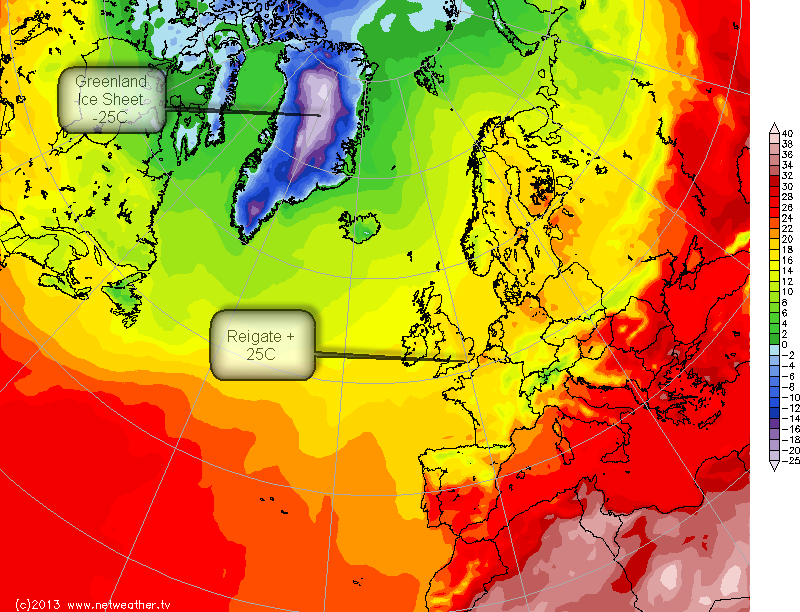 So, no surprises of course but summer is on the wane as cooler air from Iceland threatens to sweep away our benign August warm calm conditions at the end of next week. This weekend is a rather weak “dry-run” of future Autumn storms with cooler air briefly sweeping a slightly cooler airmass from NW across the UK, but Reigate should stay dry throughout the weekend, albeit a little cooler than recently. 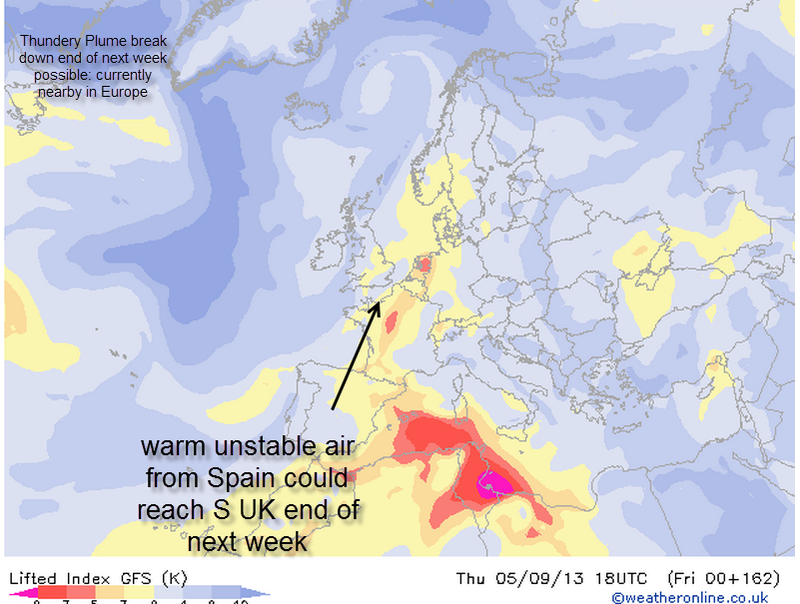 However, Summer is not going quietly and while cooler temps will inevitably win-out, mid-week looks like returning warm temps as high as 27ºC with a plume of warm air from Spain. Unfortunately, this last blast of summer heat (probably!) 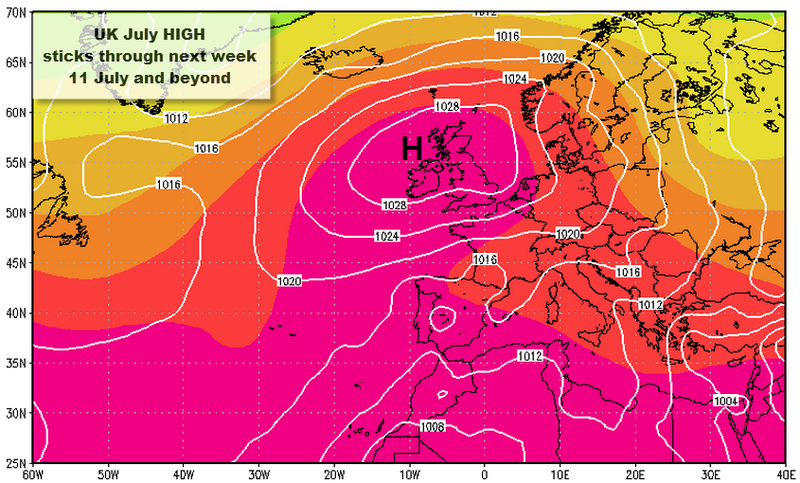 will be rudely and rapidly swept aside by brisk NW cool air flow by the end of next week associated with a LOW pressure system to the north of Scotland. There could be a brief thundery breakdown associated with this change as fronts lift away any warm air still lingering over the UK, especially the south. Most of the instability bringing any threat of storms is located over the near continent on current models but that could change and the SE might see some storms as cooler air undercuts the warm. One to watch! While Arctic sea ice melts, Greenland is becoming more snowy in summer! The Greenland ice sheet always melts in summer. Snow and ice especially melts around the lower altitude edges, coastline and often the “saddle” region between the north and south ice caps. The ice sheet snow cover always reaches a maximum at the end of winter when the entire land mass is covered in snow, 100%. The minimum snow cover reached by late summer (i.e now) is of greatest interest to climate scientists because summer snow cover varies each year and is therefore a more critical indicator of climate change. While the Greenland 2012 melt season was intense, the 2013 melt started late (May). Greenland currently has a greater coverage of snow than average for this time of year. Of greater interest is the longer term trend. This is more of a climate paradox. While the cover of Arctic SEA ice in summer is reducing in extent and thickness, the snow cover over Greenland at the end of summer appears to have increased since satellite measurements began in the 60’s. Note the downward spikes on the graph… they have reduced in size showing a greater cover of snow over Greenland surviving and occasionally falling during summer. So… paradoxically, whilst summer minimum Arctic Sea Ice cover is reducing, the cover of snow over Greenland in summer appears to be increasing. Nevertheless, before we consider this as an indicator of less global warming (AGW), a glance at a global map of 2013 snow cover departures from the average shows that Greenland is alone amongst snowy parts of the globe in this increasing trend of summer snowiness. Most high mountains which hang onto snow through the northern hemisphere summer are showing markedly LESS snow than average: Himalayas, Rockies, Alps and Pyrenees are all displaying lower than average snow cover for July. This paradox of more summer snow cover in Greenland while summer Arctic Sea ice reduces in extent and thickness is another illustration of the complexity of global climate and how easy it is to pick out data to suit any agenda. Meanwhile, forecast for today: Greenland ice cap today light winds, snow, cloudy, -25ºC; Reigate +22ºC, sunny, light winds. Sky fall over Reigate today! Today, it snowed over Reigate! The sky was actually seen falling at lunchtime. Well, OK, more accurately, cirrus cloud was seen all over the sky at midday and wonderful virga fall streaks trailed behind . Virga is a beautiful treat for cloud watchers and today was an extra-special display. Virga is any form of precipitation (snow, ice, rain), usually falling from medium or high cloud, that evaporates before reaching the ground. So… it snowed over Reigate today but 10km up and it never hit the ground. 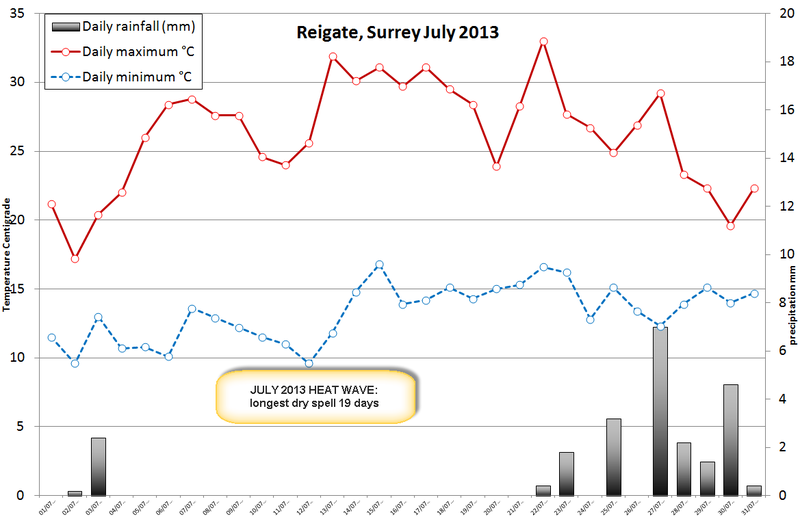 Whilst it was a warm day down in Reigate (100m, Tmax 25ºC), at 30,000 feet (10,000 m) it was a chilly -45ºC. A moist humid layer of air at 10,000 m moved in from the west filling the sky with cirrus clouds which are formed from ice subliming in humid high altitude air. Cirrus is a thin wispy cloud but can precipitate i.e. “rain”. The ice literally falls from those thin cloud veils. The cirrus today were being carried along by a brisk 40 mph westerly wind. The ice rapidly fell into slower wind speeds below: at about 5000m the wind was only 20mph. Hence, the cirrus appeared to leave veils of trailing ice particles: VIRGA. Some were probably initiated as contrails which broke up in the brisk winds. A much lower layer of cumulus appeared from local convection at about 1000 m, where the air temp was still 20ºC. Here are the charts for humidity at 10,000 m (300hPa) and 5000 m (500hPa): note the very humid air aloft and the very dry air at 5000 m. The ice never of course hit the ground because it was evaporated / sublimed at great height. Only passing aircraft might have experienced any virga precipitation. An unseasonable depression will bring significant rainfall to much of the UK on Monday. The SE will escape the worst of the heavy rain crossing the rest of the country further NW in a deepening LOW moving NE across the country through Sunday night and Monday. Many parts of the UK will experience large rainfall totals exceeding 40mm and with flooding in places. The SE is blessed by the late arrival of any fronts (weakening too) and the movement of the system to the NE driven by a brisk southerly jetstream 20,000 feet overhead. It simply passes us by. Nevertheless, Reigate could see 5mm or so of rain, mostly arriving in the form of showers in the afternoon, some heavy: so there is a twist in the “tail” of this depression. 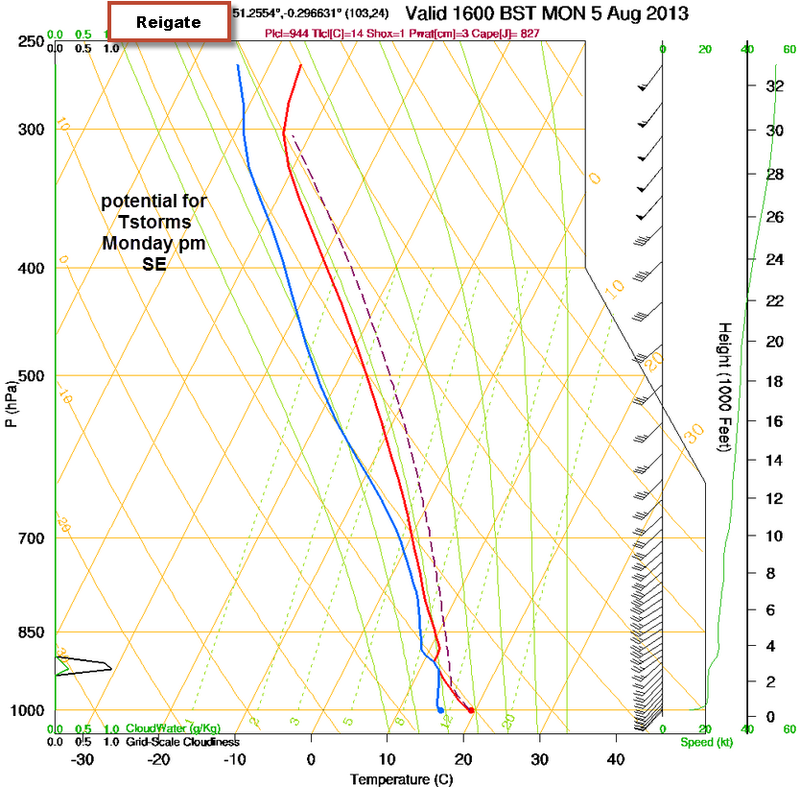 The sounding shows the instability of the air as the front crosses. Any warm parcels of air lifting through the atmosphere (dashed line) as the cold front approaches will be warmer than the surrounding incoming cool airmass (red line) so will continue to lift and this is a so-called “unstable” situation likely to form tall cumulonimbus clouds and heavy rain and possibly fast moving thunderstorms. The dew point (blue line) is also very near to the air temperature so the atmosphere to a great altitude is humid / near saturated and likely to condense large amounts of water vapour into cloud droplets. Moderate rainfall totals on a brisk air flow are possible. The far corner of the SE may see no rain at all during most of Monday but an area of instability and rapid upward velocity (lift) associated with the passage of a cold front approaching from midday could spark off heavy showers and thunderstorms in the SE and Reigate. Temperatures in the SE will be higher than anywhere else in the UK as we enjoy a warm southerly flow of upper air in the warm sector of this depression with a strong southerly jetstream starting the day over Reigate (>70mph). Temperatures at 10,000 feet will fall below freezing over Reigate during the course of the day as the cold front brings in much cooler NW air flow across the UK. 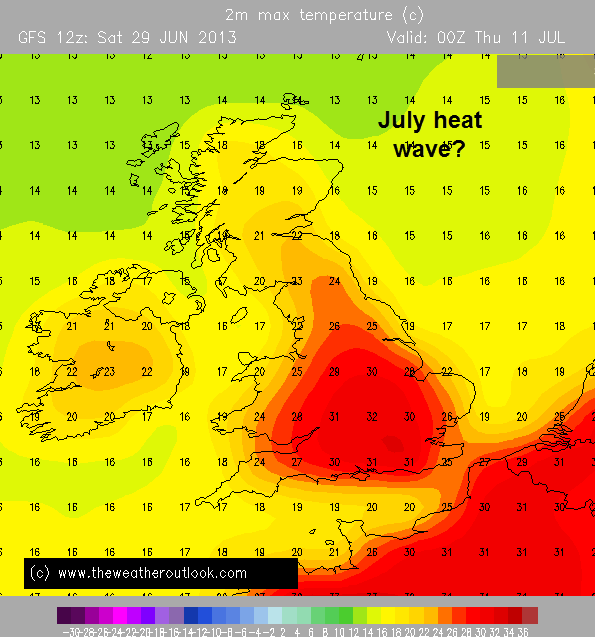 The rest of the week looks less unsettled, temperatures recovering to normal though with more rain at times. Typical August!